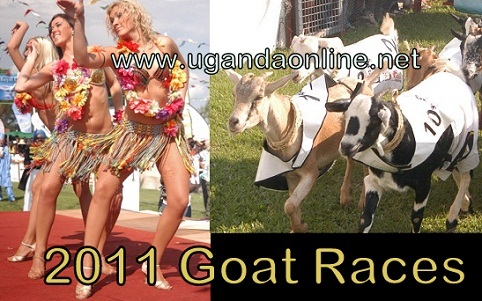 This year's goat races are on at Speke Resort Munyonyo which will comprise of 8 races with a total prize bag of Shs 30million. "The Royal Ascot Goat Races are a wonderful opportunity to show off your dress sense," as told by one of the organisers of the event. Our gallery will be showing the fashion that comes with the goats. If you don't see any pic of goats, don't say we did not warn you because anyway these are local goats which in most cases are pushed around to do the rounds. It is amazing though how these goats can get the whole Kampala just in one place. The 2011 Royal Ascot Goat races is sponsored by Balton, Crane Bank, Ericsson, Golf Course Hotel, Kampala Casino, Kampala Kids League and Club Silk among others.